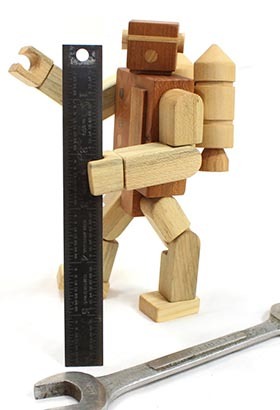 Happy Bungalow Carpenters Art Print Never was there a time where measuring was a waste of resources. I spend a lot of time in the shop making just about everything. I've never found a time where I was upset I had too many clamps. And never was there a time where measuring was a waste of time. While not a "real" blueprint (those things are stinky and prone to fading & falling apart), this drawing is printed on blue paper to mimic the look of the genuine article. This print is printed on heavy weight archival (acid free) paper with archival inks. The print won't fade or change color over the years (just keep away from direct sunlight). Note that the mat, frame, and any props are not included. Your print will not have a watermark. Prints ship in a poly sleeve with cardboard backing in a padded envelope to ensure a crumpled mess won't shop up at your door. All of our prints make come with a lifetime warranty (now including replacement in case of theft by no-good art-thieves). Note that we do our best to represent colors accurately, but colors may vary slightly due to monitor variations. copyright 2017, Don Clark - artist retains all rights to artwork; sale of print does not transfer reproduction rights Interested in purchasing more than we have listed? No problem. We can make as many as you need (typically with quick turn around times). Just send an email to don@happybungalow.com or contact us via our website.